Windows Operating System is a dynamic operating system which needs love and attention! 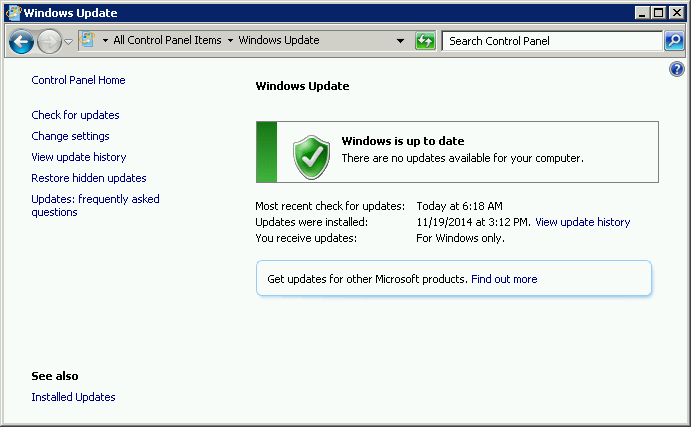 It is crucial that you run Windows Update to keep your operating system and VPS up to date. We find that 50% of users do not update their platforms, and then are surprised when they get hacked or things just start to go wrong. Our recommendation is that you run Windows Update twice per month. Doing so on a weekend will make sure that you have no interruptions to your trading. You can configure your VPS to run updates automatically for you and also install and reboot your VPS at a specific time. This can be good, however if you are running dedicated trading platforms, and you were away this would mean that you have to login to boot the platforms. As such we recommend just doing the updates manually. In the [Start Menu], simply search [Windows Update] and you'll be able to access the update window.